"Real Salt Lake's impact on the game and the diverse, brand-loyal and family-oriented fan demographic of Major League Soccer align well with JetBlue's brand. We're proud to debut our first sports-branded aircraft in the spirit of soccer, in a city that is home to more than 2,000 JetBlue Crewmembers." 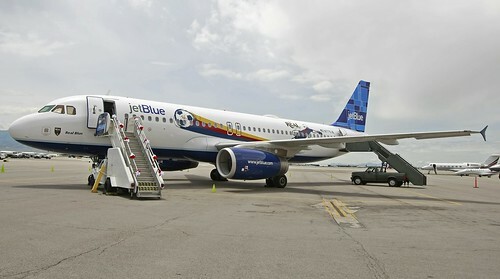 The Jet Blue-RSL partnership, which runs through the end of the 2011 season, is the first time a major airline has linked up with an individual MLS team. Jet Blue is also the official and exclusive airline of Rio Tinto stadium, where the team plays. What do you think of the activation tactic?